PALM BEACH, Fla. — North Korea’s nuclear ambitions and the U.S-China trade imbalance as well as other points of tension between President Donald Trump and Chinese President Xi Jinping are being overshadowed by the U.S. missile strikes on Syria. Nonetheless, the two leaders are meeting for a second day at Trump’s Mar-a-Lago estate as planned Friday. Their first-night summit dinner wrapped up shortly before the U.S. announced the missile barrage on an air base in Syria in retaliation against Syrian President Bashar Assad for a chemical weapons attack against civilians caught up in his country’s long civil war. Xi apparently got something out of dinner, though. Chinese state media reported late Thursday that Trump has accepted Xi’s invitation to visit China this year. The official Xinhua News Agency reported that Trump will travel to China at an “early date” in 2017, but gave no details. The White House downplayed expectations for a breakthrough on issues like trade and tariffs, insisting that the 24-hour summit is mostly an introductory meeting for the two leaders. Within Trump’s administration, divisions remain over how to approach China. Still, North Korea was a top priority for Trump in the meetings with Xi. The American president told reporters traveling with him to Florida that he thinks China will “want to be stepping up” in trying to deter North Korea’s nuclear ambitions. For his part, Xi was expected to seek assurances that Trump will not interfere in the territorial dispute over the South China Sea or question the “One China” policy by reaching out to Taiwan’s leader again, as Trump did during the transition. 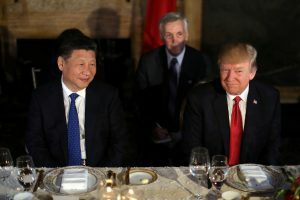 Left: Chinese President Xi Jinping and President Donald Trump attend a dinner at the start of their summit at Trump's Mar-a-Lago estate in West Palm Beach, Florida. Photo by REUTERS/Carlos Barria.